THE Election Court, at the Court of Session in Edinburgh, is hearing a legal challenge to the election of Alistair Carmichael as Orkney and Shetland MP. Proceedings are being filmed live by STV, which has made its footage available to Shetland News. The case began shortly ater 10.30am on Monday. 4.04pm – The court has adjourned until 10.30am on Tuesday. 3.30pm – QC Mitchell is arguing that Carmichael effectively admitted lying to prevent himself losing his seat (which he retained with a massively reduced majority of 817 votes): “nothing we put forward on this is contradicted”, he claims. 3.23pm – After a clumsy allusion likening the case to that of a piece of defective machinery, QC Mitchell concedes it is “probably a bad idae to go into analogies”. “Yes, I think so,” replies Lady Paton. It’s fair to say the petitioners’ submission is every bit as dry as the respondents’. 3.18pm – Under reference to section 106 of the Representation of the People Act (see 10.45am), QC Mitchell says Mr Carmichael says he is “not ‘a person’ under the meaning of the act”. Carmichael is not disputing that he made certain statements to Channel 4 and the Daily Record newspaper. He does not dispute that they were statements of fact, or that they were false. He doesn’t admit the word “false” – the euphemism was “a mis-statement of awareness” – but he has described them elsewhere as “dishonest and untruthful”. He does not dispute that it was before or during an election; he does dispute that it was for the purpose of affecting the return of any candidate at the election. 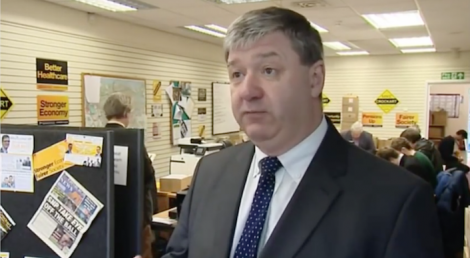 QC Mitchell says Carmichael made the statements in an attempt to affect his own return, and by extension the return of any other candidate in Orkney and Shetland – if he succeeded, others wouldn’t. 3.05pm – QC Mitchell says the draft and final notes from both the petitioners and the respondents spell out that the background to the case is “largely undisputed”, though there are differences on some details. 2.38pm – The court confirms that there is no objection to either party putting its notes of argument into the public domain. In 1868, when the Election Court was founded, it took over a jurisdiction of the House of Commons. Ultimately what it does is report to the House of Commons as the ultimate adjudicator, QC Mitchell says. 2.32pm – With QC Mitchell now making the petitioners’ case, it looks like the hearing will continue into tomorrow morning. The petition was brought by four Orcadian constituents, who launched an appeal that raised £88,000 to cover the legal costs. 2.28pm – A helpful summary of this morning’s submission from QC Dunlop on the Peat Worrier blog, which is written by law lecturer Andrew Tickell. Dunlop suggested that the logic of the petitioners’ case would effectively strap politicians “to a lie detector and administered a truth serum” during election campaigns. “Is that such a bad thing?” was the sharp quip of Lord Matthews in response. 2.20pm – QC Dunlop finishes off by saying he believes the case brought is not relevant and the petition should be rejected. 2.12pm – As his QC continues to defend his corner, Mr Carmichael himself is not present at proceedings and instead is carrying out his normal constituency/parliamentary work. Lots of people on Twitter remarking that the live televised coverage of this case highlights how opaque Scotland’s legal system is. The first three hours or so have certainly been very dry, with a fair old sprinkling of words and terms you’d never hear used outside a courtroom. #Carmichael case is a reminder that the Scots legal system is so complex that the majority of citizens are excluded from understanding it. 2.05pm – The hearing has resumed after lunch. Dunlop – it is “plain” that we are talking about the election in which that candidate is standing, and not the general election as a whole. 12.20pm – Mr Dunlup has now moved on to the second part of his submission to the Court of Session in which he explores whether Carmicheal’s undisputed words and actions reflect on his character or conduct. 11.39am – They’re back. Mr Dunlop resumes his address to the Court of Session. 11.25am – There will be a 10-minute break in court proceedings. 11.06am – Mr Dunlop continues addressing the court. Some useful background on the case from the Lallands Peat Worrier blog here and on Scottish Constitutional Futures website from University of Aberdeen senior law lecturer Heather Green here. 10.58am – Section 106 strikes at the person who makes or publishes a statement, Mr Dunlop says. There is no need for the false statement to be published in election material – a false statement even to a small group of friends would suffice. There is no need for the false statement to have any “causative” effect. The consequence of making the statement is the loss of the seat, regardless of whether or not it conceivably could have made any difference [to the election outcome]. A landslide victory would fall to be annulled by a false statement of “complete peripherality” as long as it met the other requirements of the act. Mr Dunlop is arguing the court must adopt a strict, narrow view of the 1983 act because of the “penal” consequences – depriving an MP of his/her office. He also submits that a slur must relate to a candidate in an election and affect his/her candidacy. 10.45am – Mr Dunlop continues addressing the courtroom. The hearing has been appointed to determine the three issues in the notes – whether there is anything that requires further inquiry by the election court. 10.39am – the case is now getting underway with Mr Roddy Dunlop QC addressing the bench on behalf of Mr Carmichael. He is moving to dismiss the petition as “irrelevant in the Jamieson sense”, meaning that even if petitioners prove their allegations the petition is still bound to fail. The background is “well known and largely undisputed”. Shortly after dissolution of parliament on 30 March 2015, the Daily Telegraph reported a leaked memorandum which suggested that Nicola Sturgeon, First Minister and SNP leader, had indicated to the French ambassador that she would prefer it if the Tories were to win the forthcoming general election. The memorandum had been leaked to the telegraph by Carmichael’s special adviser Euan Roddin. He had been asked to, and did, ascent to the leak. Sturgeon demanded an inquiry into the leak, which was initiated under Sir Jeremy Heywood on 5 April. That same day, Carmichael was interviewed by Channel 4. He denied prior knowledge of the leak and “it is accepted that that was not correct”. On 7 May the election took place and the following day, Carmichael was returned as MP for Orkney and Shetland. The petitioners argue that what he said offended section 106 of the Representation of the People Act 1983 with the consequence that his election is void.